"The Basic Additive Manufacturing Process" discusses the general steps involved in most additive manufacturing (AM) procedures. Important steps include creating 3D computer models, converting those models to AM compatible file formats, setting up and running an AM machine, and part removal and post-processing. The manufacturing industry is progressively finding AM to be an important resource in rapid prototyping and creating end-use parts. Thus, it is increasingly important that engineers and operators understand AM technology and its basic process. Understanding the basic AM process will help engineers and operators more easily learn a specific AM operation's unique considerations and procedures. A basic understanding of AM can also help assess AM's value within a manufacturing operation. After taking this class, users will understand the standard steps involved in any AM process. Distinguish between AM methods that deposit build material. Distinguish between AM methods that manipulate build material in or on a component. Describe the various materials used in AM. Describe basic design considerations for AM. Describe the various uses of AM parts and how they affect DFAM. Describe how to select a material during the DFAM process. Describe how to select an AM method. Identify the order of the steps for a basic AM operation. Describe how CAD is used in an AM operation. Describe STL files and how to covert CAD files to STL files. Describe how to convert STL files to build files. Describe the process of running the AM machine. Describe the process of removing an AM part from the machine. Describe the process of cleaning an AM machine. Describe the basics of a DMLS process. 3D Three-dimensional. Having height, width, and depth. 3D parts are created during additive manufacturing (AM) processes. abrasive finishing The use of an abrasive, such as sandpaper, to polish and smooth the surface of a part. Abrasive finishing is commonly used to improve the surface finish of an additively manufactured part. action An executable process in a computer program. An action is any process a user can initiate in a program, such as turning text bold or sending a part to be manufactured from the program to a manufacturing machine. Additive Manufacturing File AMF. An emerging standardized computer file that can communicate the build specifications of a part to an additive manufacturing machine. The Additive Manufacturing File is based on extensible markup language (XML) and easily incorporates important part specifications, such as material gradation and texture variation. aerospace The industry that covers machines or vehicles of flight. Aerospace manufacturers generally require highly specialized parts made with very high precision. alloy A metal made by intentionally adding specific amounts of one or more other materials. An alloy often has improved mechanical and physical properties due to the added material. binder An adhesive material that holds together two or more other materials. Binder holds together powdered materials to make a solid part in binder jetting. binder jetting An additive manufacturing (AM) method in which liquid binder is used to join powdered materials to create parts. Binder jetting can create parts out of metal, polymer, or ceramic. biomaterials A natural material that composes a part or all of a living structure. Biomaterials, such as living cells and tissues, can be used in some additive manufacturing (AM) methods. bracket A mounted support device. Brackets can be optimized through additive manufacturing (AM) methods as they impose fewer design limitations than traditional manufacturing operations. brush A tool composed of a bundle of soft bristles. A brush can be used to remove powder from additively manufactured parts created using powder bed fusion (PBF) methods. build boxes A removable, enclosed build platform used in additive manufacturing (AM). Build boxes are used to make powder removal easier for additive manufacturing powder bed fusion (PBF) methods. build file Computer information that provides detailed instructions to an additive manufacturing machine. Build files include information about the exact shape and size of each layer as well. build file Computer information that provides detailed instructions to an additive manufacturing machine. Build files include information about the exact shape and size of each part layer. build function A menu selection or control-panel button that activates an additive manufacturing (AM) part build. The build function, or print function, is selected after the build file has been loaded and the machine prepared. build material The substance used to create an additively manufactured part. Build material includes metals, polymers, composites, and ceramics. build parameters An adjustable variable that controls an aspect of an additive manufacturing process. Build parameters include layer thickness and deposition rate. build plates A removable flat surface on which an additively manufactured part is constructed. Build plates are removable build platforms and must be carefully centered and leveled to ensure a successful build. build platform The flat surface on which a part is additively manufactured. The build platform can either be a permanent surface from which parts are removed or a removable surface, which is sometimes referred to as a build plate. build rates The time it takes to build a part or the number of parts that can be made in a set period of time. Build rates for additive manufacturing are considerably slower than traditional manufacturing build rates. CAD Computer-aided design. Computer software used to create a three-dimensional (3D) model of a part before it goes into prototyping or production. CAD models are converted to an STL format then to a build file for use by additive manufacturing (AM) machines. carbon fiber A material made from slender, thread-like strands of carbon, a strong nonmetallic element. Carbon fiber is a rigid material with good tensile strength, chemical resistance, and temperature tolerance. ceramics A hard, brittle material that can withstand high temperatures and resist corrosion. Ceramic parts can be created through additive manufacturing (AM) methods such as binder jetting and powder bed fusion (PBF). chemical Relating to the interaction between substances. Chemical means, such as a chemical bath, can be used to separate support structures made of different material than the part in additive manufacturing (AM). chemical bath A specialized solution that an operator dips an additively manufactured part into in order to remove support structures or that an operator uses to clean a build platform. A chemical bath is formulated to dissolve support structures without harming the part. chisels A sharp metal tool that is used to remove material or parts. A chisel can be used to separate metal additive manufacturing (AM) parts from build platforms. coating The application of a protective film to the surface of an object to improve its functionality. Coating improves a part's ability to withstand environmental hazards such as extreme heat or flying debris. composites A material made by mixing together two or more of the following groups: metals, polymers, and ceramics. The composite most often used in additive manufacturing (AM) is a polymer reinforced with hard threads of carbon called carbon fibers. computer-aided design CAD. Computer software used to create a three-dimensional (3D) model of a part before it goes into prototyping or production. Computer-aided design models are converted to an STL format then to a build file for use by additive manufacturing (AM) machines. computer-aided engineering CAE. Computer software that helps part manufacturers with the engineering aspect of part design. Computer-aided engineering is helpful in assessing how a part will respond to exposure to a load, fluid movement, and other real-world conditions. conceptual model A nonfunctional model used to physically demonstrate design ideas for a part. Conceptual models are often composed of polymer and made using additive manufacturing (AM) processes such as material extrusion or vat photopolymerization. cure To cause a material to bond and solidify through heat, time, or chemical means. A laser cures photopolymers in vat photopolymerization processes. cutting tools A device made of hard, tough material that is used to remove metal by creating chips. Cutting tools can be created, and optimized, using additive manufacturing (AM) processes. DED Directed energy deposition. An additive manufacturing (AM) process in which focused thermal energy is used to melt materials as they are fed or blown through a nozzle. DED is often used with powdered or wire metal. defects An imperfection in a part that prevents it from operating correctly. Defects sometimes appear in additively manufactured parts when the layers do not adhere to each other correctly or in places where support structures were removed. degrade To break down slowly over time due to exposure to various environmental conditions. Some polymer parts degrade due to heat exposure. design for additive manufacturing DFAM. The methodology of planning, testing, and creating an additively manufactured part that functions optimally. Design for additive manufacturing allows engineers to mostly focus on part functionality. desktop A machine designed to fit easily on a standard desk. Desktop models of AM machines are more affordable but less precise than larger, more advanced models. DFAM Design for additive manufacturing. The methodology of planning, testing, and creating an additively manufactured part that functions optimally. DFAM allows engineers to mostly focus on part functionality. digital light processing DLP. A vat photopolymerization process that uses a specialized device to create an entire part layer in one flash of light. Digital light processing builds parts more quickly than some other vat photopolymerization processes. direct metal deposition DMD. A directed energy deposition process that uses a laser or plasma arc to melt build materials as they are deposited on a build platform. Direct metal deposition most frequently uses metal powders as build materials. direct metal laser sintering DMLS. A powder bed fusion (PBF) process that uses a laser to fuse successive layers of metal powder. Direct metal laser sintering can produce complex metal parts, though they often require extensive post-processing. directed energy deposition DED. An additive manufacturing (AM) process in which focused thermal energy is used to melt materials as they are fed or blown through a nozzle. Directed energy deposition is often used with powdered or wire metal. DLP Digital light processing. A vat photopolymerization process that uses a specialized device to create an entire part layer in one flash of light. DLP builds parts more quickly than other vat photopolymerization processes. DMLS Direct metal laser sintering. A powder bed fusion (PBF) process that uses a laser to fuse successive layers of metal powder. DMLS can produce complex metal parts, though they often require extensive post-processing. download The process of transferring data, usually a copy, from one computer to another. Some computer programs can be downloaded from the Internet for free or for a fee. electron beam A narrow stream of focused electrons that creates thermal energy. Electron beams are sometimes used in additive manufacturing (AM) methods, including directed energy deposition (DED) and powder bed fusion (PBF). electron beam additive manufacturing EBAM. A directed energy deposition process that uses an electron beam to melt materials as they are deposited on a build platform. Electron beam additive manufacturing can use either wire or powder feedstock as build materials. end-use Designed to be used directly by a consumer or directly in another manufactured product. End-use products created by additive manufacturing (AM) include medical implants, custom dental devices, and camera equipment. engineer A person who designs machines, parts, or other technically complex components or features. In manufacturing, engineers are responsible for designing a part, including creating the exact specifications for that part and deciding how best to build and finish the part. extrusion temperature The specific heat used by the heating elements to melt materials for the material extrusion processes in additive manufacturing (AM). Extrusion temperature is usually set based on the specific material, most often polymer, used in a particular material extrusion operation. facets An individual triangle in the mesh of an STL file. Facets must be oriented correctly for the additive manufacturing (AM) machine to be able to properly build the part. fatigue resistance A material's ability to resist failing due to repeated external stress. Fatigue resistance is especially important for parts that move during operation. FDM Fused deposition modeling. A material extrusion process that builds parts through extruding successive layers of material. FDM is one of the most accessible and affordable types of additive manufacturing (AM), though it creates parts with poor surface finish and has relatively low build speed. features A distinguishing characteristic that performs a function on a part. Features include grooves, shoulders, and hinges. feedstock roll The cylindrical mechanism on a sheet lamination machine that holds and dispenses thin sheets of build material. Feedstock rolls often hold rolls of paper, polymer, or metal. filaments An extremely thin strand of material. Filaments of thermoplastic material are sometimes used in material extrusion as build material. file formats A unique way of storing computer data so that it can only be accessed by certain programs. File formats for additive manufacturing (AM) include STL files, Additive Manufacturing Files (AMF), and Virtual Reality Modeling Language (VRML) files. filing An abrasive finishing process that involves using a thin metal strip with small, sharp teeth to smooth out the surface of a part. Filing creates an even surface finish. fixtures A customized workholding device used to position and hold a workpiece during a manufacturing process. Fixtures can be created quickly and optimized through additive manufacturing (AM) processes. flammable A material that can easily ignite and catch fire. Flammable materials, such as powdered additive manufacturing (AM) build material, must be handled correctly and with the proper safety equipment, such as fire extinguishers. functional Able to correctly and efficiently perform a specific task. The functional complexity of additive manufacturing allows for the creation of parts that can perform tasks immediately after being built. functional prototypes A part model made to represent the composition and design of the proposed final part. Functional prototypes are used to test how a part will perform in its intended application. fused deposition modeling FDM. A material extrusion process that builds parts through extruding successive layers of material. Fused deposition modeling is one of the most accessible and affordable types of additive manufacturing (AM), though it creates parts with poor surface finish and has relatively low build speed. geometric The linear and curved shapes that characterize a part. Geometric complexity is one of the key advantages of additive manufacturing. glass A transparent material made from silica and other materials. Glass parts can be created using some additive manufacturing (AM) methods, such as material extrusion. gloves Protective hand covers that reduce the risk of injury and exposure to hazardous material. Gloves are used by additive manufacturing (AM) machine operators to limit exposure to build materials and high-temperature parts and components. gradation Containing a series of changes in material composition. Gradation allows a part to have different properties at different places. grinding A subtractive manufacturing process used to improve surface finish and bring parts into close tolerance. Grinding is used as a post-processing procedure in additive manufacturing (AM). hazardous Potentially dangerous or unsafe. Additive manufacturing (AM) involves the use of hazardous material, such as powdered materials that can cause respiratory irritation. heat treatment Controlled heating and cooling processes used to change the structure of a material and alter its physical and mechanical properties. Heat treatment is often used to improve the hardness and durability of a metal additively manufactured part. high-stress Having a large amount of force attempting to deform an object. High-stress applications, such as aerospace and automotive applications, require parts that have been carefully designed to function properly while withstanding a large amount of force. hole diameter The size of a circular opening on a part. Hole diameter is limited to a certain minimum and maximum based on the additive manufacturing (AM) process in use. inert gas A gaseous substance that does not chemically react with any other substances. Inert gas is used in additive manufacturing (AM) methods that use a laser or similar heat source, such as powder bed fusion (PBF), in order to ensure an environment that will not promote the formation of part defects. infill A cross-hatched or honeycombed structure that can fill the interior of an additively manufactured part. Infill provides a part with additional strength and support. injection molding A shaping process in which resin is heated in a barrel and then injected into a mold. Injection molding uses high pressures to create complex parts. interface The control panel and display that the operator uses to interact with and control a machine. Each additive manufacturing machine has a unique interface that the engineer or operator must be trained to use. internal channels A pathway for air, coolants, or other substances to travel through the inside of a part. Internal channels are most easily created through additive manufacturing (AM) processes. jigs A customized workholding device used to position and hold a workpiece while guiding the location and motion of a tool. Jigs are a type of workholding device that can be created using additive manufacturing (AM). joint A point at which two objects or materials are connected, usually facilitating movement between the objects or materials. Joints can be directly manufactured using additive manufacturing (AM) with no additional assembly required. laminated object manufacturing LOM. A sheet lamination process which uses an adhesive to bond successive layers of material together to build a final part. Laminated object manufacturing most frequently uses paper as build material but can also use thermoplastic and composite sheets. laser A device that generates an intense beam of light that can be precisely aimed and controlled. Lasers are used to selectively solidify or combine materials in a number of additive manufacturing (AM) methods, including powder bed fusion (PBF), vat photopolymerization, and directed energy deposition (DED). laser-engineered net shaping LENS. A directed energy deposition process that uses a laser beam to melt materials as they are deposited on a build platform. Laser-engineered net shaping is sometimes referred to as laser powder forming. lattice structures A repeating, symmetrical pattern of crossing strips of material that leaves diamond- or square-shaped gaps between them. Lattice structures provide excellent strength to a part. layer thickness The amount of material applied to or solidified in a layer vertically in one pass of an additive manufacturing (AM) process. Layer thickness helps determine build rates with large layer thicknesses generating fast build rates but less accurate parts. lights-out manufacturing Facilities that are fully automated and can operate without any employees on-site. Lights-out manufacturing allows for processes to operate overnight and during the weekend. load The amount of force or pressure placed on a component or system. The effects of a load on a component can be digitally assessed using computer-aided engineering (CAE) software. material extrusion An additive manufacturing (AM) method that uses a nozzle to dispense material, usually a thermoplastic filament, onto a build platform. Material extrusion is sometimes referred to as fused deposition modeling (FDM). material jetting An additive manufacturing (AM) method in which droplets of build material are selectively deposited onto a build platform. Material jetting systems use a photopolymer that is cured by ultraviolet (UV) light. mechanical Using physical force. Additive manufacturing (AM) support structures can be removed by mechanically using pliers to tear away the structures. mechanical properties The collection of properties that describe a material's ability to compress, stretch, bend, scratch, dent, or break. Mechanical properties of a material are determined by its molecular structure. metal A hard, strong material that conducts electricity and heat. Metal powders and wire are used in additive manufacturing (AM) to create solid, finished metal parts. microstructure The shape and alignment of microscopic components in a material. Microstructure helps determine the properties of a material. milling A traditional machining operation that uses a multipoint horizontal or vertical cutter to remove metal from the surface of a workpiece. Milling is used to resurface build platforms in some additive manufacturing (AM) methods as well as to finish or reshape some AM parts. model A physical representation of a part or other object. Models are usually three-dimensional and can be physical or digital. molds A hollow cavity that holds heated liquid material and imparts its shape on the material as it cools. Molds with exceptional accuracy can be created using additive manufacturing. network A system where two or more computers or machines are connected through a wireless router or cables to communicate with each other. A network facilitates quick and easy communication between computers and machines, streamlining a number of work processes. nozzle A spout at the end of piping or tubing through which substances are funneled. A nozzle is used to distribute build material during material extrusion. operator A person trained to run a specific machine. Operators are responsible for ensuring that a machining process runs properly, efficiently, and safely. part orientation The position a part will be manufactured in during an additive manufacturing process. Part orientation involves balancing part quality and build times. PBF Powder bed fusion. An additive manufacturing (AM) method that uses thermal energy to fuse together layers of powdered polymer, metal, ceramic, or other material. PBF includes several processes, such as selective laser sintering (SLS) and direct metal laser sintering (DMLS). pellets A very small, round ball of material. Pellets of thermoplastic material are sometimes used in material extrusion as build material. 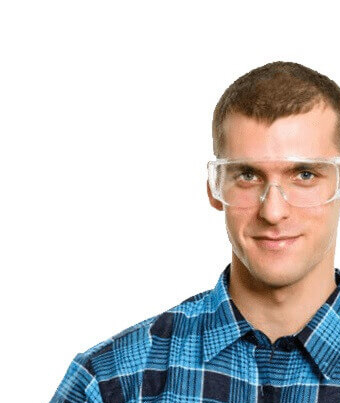 personal protective equipment PPE. Any clothing or device worn to minimize exposure to hazards or prevent injury. Common additive manufacturing (AM) personal protective equipment includes gloves, safety goggles, and nonflammable clothing. photopolymer A type of photoreactive fluid plastic that cures and hardens when exposed to light. Photopolymers, or resins, appear to be liquids but are technically viscous solids and are used in material jetting and vat photopolymerization. photoreactive A material that chemically reacts to exposure to ultraviolet (UV) light. Photoreactive materials used in additive manufacturing, such as photopolymer or resin, solidify and harden when exposed to UV light. physical properties A set of characteristics that describes how a material responds to environmental, thermal, electrical, and magnetic forces. Physical properties describe how a material reacts to forces other than mechanical forces. plastic A polymer material that is lightweight, corrosion resistant, and has a low melting point. Plastics are usually easy to shape and form. polishing An abrasive finishing process used to improve the surface of a part to a very fine finish. Polishing methods include bead blasting and deburring. polymers A natural or synthetic material group that consists of very large molecules held together by either a secondary or a primary bond. Polymers include silk, nylon, rayon, and plastics. post-processing A procedure used to clean, improve, or otherwise finish a part for use by a manufacturer or consumer. Post-processing for additively manufactured parts includes abrasive finishing, heat treatment, and painting. powder bed The area of a powder-based additive manufacturing (AM) machine that holds granulated build material and provides or holds the build platform. Powder beds are used in powder bed fusion (PBF) and binder jetting. powder bed fusion PBF. An additive manufacturing (AM) method that uses thermal energy to fuse together layers of powdered polymer, metal, ceramic, or other material. Powder bed fusion includes several processes, such as selective laser sintering (SLS) and direct metal laser sintering (DMLS). powdered A collection of small, uniform, and separate particles of a solid material. Powdered materials are fused together into a solid part in the various powder bed fusion (PBF) additive manufacturing (AM) processes. pressure The exertion of a mechanical force upon an object. Pressure exerted by a roller can be used to help fuse layers in a sheet lamination operation. primary process An additive manufacturing (AM) application where the end result is a prototype or end-use part. Primary processes are an increasingly large usage of AM in manufacturing. print A design representing the specific dimensions and production considerations for a part or prototype. A print is often created before building the computer-aided design (CAD) version of an additive manufacturing (AM) part. print function A menu selection or control-panel button that activates an additive manufacturing (AM) part build. The print function, or build function, is selected after the build file has been loaded and the machine prepared. printer head The moving component on a printer that holds and distributes the part build material. Printer heads are used in material jetting and binder jetting machines. projector A device that creates a two-dimensional layer of light. Projectors are used to create an entire part layer in a single moment in digital light processing (DLP) processes. prototype A preliminary model of a part used to evaluate the look and performance of a design. Prototypes are used to determine the specifications for the final part. pure Not containing any intentionally added materials. Pure metals can have optimal physical properties, such as electrical conductivity, but often have poor mechanical properties, such as strength. purge To clean a nozzle used in an additive manufacturing (AM) process, such as material jetting, material extrusion, or binder jetting. Operators purge the nozzle by scraping it with a rigid wire or soaking it in solvent. rapid prototyping A product development technique that uses additive manufacturing (AM) to create prototypes for a traditional manufacturing operation. Rapid prototyping allows engineers to quickly create a number of prototypes in a short time period, reducing lead time. raw materials An unprocessed or lightly processed component used to make the finished part. Raw materials in manufacturing include metal, polymer, and ceramic. resin A type of fluid plastic that cures and hardens when exposed to light. Resins, or photopolymers, appear to be liquids but are technically viscous solids and are used in material jetting and vat photopolymerization. resolution The fineness of detail in a computer-aided design (CAD) model. Resolution helps determine the surface finish of an additively manufactured part, with greater resolution leading to better surface finish. respirators A breathing device worn to prevent the inhalation of hazardous gases or fumes. Respirators are worn by additive manufacturing (AM) machine operators to reduce exposure to powdered material in the air and fumes produced by the AM process. resurface The process of restoring a flat area to its original shape and specifications. Operators must resurface build platforms used to create metal additive manufacturing (AM) parts to remove any residual part material that would affect the next build. reverse engineering A process that captures geometric data of an existing object to convert it to a three-dimensional (3D) computer-aided design (CAD) model. Reverse engineering can be used to create an additive manufacturing (AM) part from a traditionally manufactured part. rigid Resistant to bending. Rigid materials are stiff and inflexible and are useful in applications where a part must hold its shape. rigid Stiff and inflexible. Rigid wires can be used to remove residual build material from nozzles used in some additive manufacturing (AM) machines. roller A cylindrical device used in additive manufacturing (AM) to either deposit and level build material or fuse layers of a part together. Rollers are used to level material in vat photopolymerization and powder bed fusion methods and to fuse layers together in sheet lamination methods. rubber A synthetic or natural material that is often elastic. Rubber can be used to make nonslip surfaces, such as the grips for tooling. sand Loose, granular material derived from the crumbling of rocks. Sand can be used in additive manufacturing (AM) to create sand casting molds. saws A multipoint cutting device that is used to separate materials. A saw can be used to remove a metal additive manufacturing (AM) part from a build platform. scanning The act of examining a surface, object, or body part using an electromagnetic beam or other detector. Scanning creates a computer-generated three-dimensional (3D) model of the scanned object, which can then be turned into an additively manufactured part. scraper A tool with a wide, flat blade. A scraper can be used to remove additively manufactured parts without damaging the build platform. scraper bar A moving rectangular device used in some additive manufacturing methods to deposit and/or level build material. Scraper bars are commonly used in vat photopolymerization, powder bed fusion (PBF), and binder jetting additive manufacturing (AM) methods. secondary process An additive manufacturing (AM) application other than creating a prototype or end-use part. Secondary processes include using AM to create a jig or fixture, help create a mold, or repair a damaged workpiece, among other processes. secure digital card SD card. A small, portable memory disk that can be used to store and transfer data, such as build files for an additive manufacturing part. Secure digital cards are placed in a machine through a specialized slot. selective deposition lamination SDL. A sheet lamination process which applies heat and pressure to bond successive layers of material together to build a final part. Selective deposition lamination most frequently uses paper as build material but can also use thermoplastic and composite sheets. selective laser sintering SLS. A powder bed fusion (PBF) process that builds a part by heating and solidifying layers of powdered material, usually a polymer. Selective laser sintering parts are strong and durable but usually have poor surface finish. service bureaus A company that provides a specific service. Service bureaus can assist manufacturers with rapid prototyping, producing end-use parts, post-processing, and many other additive manufacturing (AM) steps. single-point An additive manufacturing (AM) device that layers, sinters, or cures a part layer one small dot at a time. Single-point sources include nozzles and lasers. SLA Stereolithography. A vat photopolymerization process that builds a part by tracing a single-point ultraviolet (UV) light over the surface of photopolymer material to selectively cure it. SLA is often used for making softer parts that require a high degree of customization such as dental aligners or hearing aids. slicers A computer program that divides an STL file into layers for additive manufacturing (AM). Slicers, or slicing programs, can either be separate computer programs or part of the machine interface. slicing program A computer program that divides an STL file into layers for additive manufacturing (AM). Slicing programs, or slicers, can either be separate computer programs or part of the machine interface. software The coded instructions, formulas, and operations that structure the actions of a computer. Software includes any program added to the physical computer, or hardware, to enable it to perform specific tasks, such as allowing engineers to build three-dimensional (3D) part models. solvent A chemical material that attempts to dissolve another material. Solvents are used after some additive manufacturing (AM) processes in order to remove support material or clean build platforms. specifications A description of the essential physical and technical properties of a part. Specifications, sometimes called specs, include information on the shape of a part as well as required mechanical and physical properties. springs A flexible device that yields under compressive force to its original shape when the force is removed. Springs are used to apply force, control motion, and store energy. stereolithography SLA. A vat photopolymerization process that builds a part by tracing a single-point ultraviolet (UV) light over the surface of photopolymer material to selectively cure it. Stereolithography is often used for making softer parts that require a high degree of customization such as dental aligners or hearing aids. STL file The file format that is converted to a build file so that it can be used by additive manufacturing (AM) machines. STL files represent 3D models as a series of interconnected triangles. strength A material's ability to resist forces that attempt to break or deform it. Strength in an additively manufactured part is determined by its design, build material, and AM method. strength-to-weight ratios The relationship between a material's strength and its weight. Materials that are light but also very strong have a high strength-to-weight ratio. support materials The substance used to create the support structures for an additively manufactured part. Support material is often slightly different from the build material so that it can be more easily removed once the part is finished. support structures A reinforcing component used to hold the weight of an additively manufactured part as it is being constructed. Support structures are removed from the part once the build is complete. surface finish The degree of smoothness on a part's outer surface after it has been manufactured. Surface finish quality varies depending on the additive manufacturing (AM) process used and the build parameters. thermal energy Energy in the form of heat. Thermal energy is used to fuse materials together in some additive manufacturing (AM) methods, such as directed energy deposition (DED) and powder bed fusion (PBF). thermal resistance A material's ability to remain unchanged due to exposure to extremely high or low temperatures. Thermal resistance allows materials to maintain their properties and integrity even at extreme temperatures. three-dimensional 3D. Having height, width, and depth. Three-dimensional parts are created during additive manufacturing (AM) processes. titanium A nonferrous metal that is lightweight, corrosion resistant, and has a high strength-to-weight ratio. Titanium and its alloys are often used in the aerospace industry. tolerances An unwanted but acceptable deviation from a given part dimension. Tolerance is, in part, determined by the resolution of the three-dimensional (3D) part model processed by the additive manufacturing (AM) machine. tooling Assorted tools used in various manufacturing processes. Tooling that can be created by additive manufacturing (AM) processes includes molds, assembly fixtures, and medical guides. toolpaths The series of coordinate positions that determine the movement of a tool during a manufacturing operation. Toolpaths for additive manufacturing machines are automatically generated by specialized slicing computer programs that analyze the 3D part model and divide it into layers. topological optimization The rearrangement of a part's geometric and/or material components to optimize its performance. Topological optimization is based on a given set of load and environmental conditions compared to performance requirements. turbine blade A flat component attached to the rotary axis of a turbine to direct air, steam, or gas flow. Turbine blades can be made using an additive manufacturing (AM) process such as direct metal laser sintering (DMLS). ultraviolet UV. A potentially harmful wavelength of light that is below, or shorter than, violet on the light spectrum. Ultraviolet light is used to selectively harden a photopolymer in vat photopolymerization processes. universal serial bus drive USB drive. A small, portable memory device that can be used to store and transfer data, such as build files for an additive manufacturing part. Universal serial bus drives are connected to AM machines through a USB port. UV Ultraviolet. A potentially harmful wavelength of light that is below, or shorter than, violet on the light spectrum. UV light is used to selectively solidify photopolymer in vat photopolymerization processes. vacuum A suction tool used to collect loose dust, dirt, and debris. A vacuum is used to remove the excess powder left around a part created through powder bed fusion (PBF) methods. vat An industrial receptacle used to hold fluids. Vats are often used to hold photopolymers in vat photopolymerization. vat photopolymerization An additive manufacturing (AM) method that builds a part by curing layers of photopolymer with light. Vat photopolymerization processes include stereolithography (SLA) and digital light processing (DLP). visual aids An object used to illustrate and supplement verbal or written information. Visual aids created using additive manufacturing (AM) include conceptual, construction, and surgical models. wall thickness The amount of material in a flat vertical barrier in a part. Wall thickness must fall within certain parameters for different additive manufacturing (AM) processes. waxes A malleable, water-resistant organic material with a low melting point. Wax is sometimes used as build or support material during material jetting. wire electrical discharge machining Wire EDM. A material removal process where electricity is fed through a thin strip of metal in order to shape or separate parts. Wire electrical discharge machining is often used to accurately cut metal additive manufacturing (AM) parts from the build plate. The device (we inspect) has to work 24/7. Quality is critical. Tooling U-SME training not only helped us increase quality, it shortened learning curves.